UPDATE: renovations are complete! On March 4, 2019 we recevied approval from the town to begin using the renovated areas of the church building. Worship Service will be in the sanctuary starting March 10. On Sunday, March 17 we will have a special dedication service at 9am which will include testimonies, pictures, and a time for prayer. We will have our regular worship service at 10:30am. On Sunday, March 24 Sunday School will begin again at 9am, followed by the regular worship service at 10:30am, then we will have a meal after church in the gym. We are renovating our building during the summer of 2018. The renovations began on June 12, 2018 and are still ongoing as of January, 2019. We hope to be done by mid-February, 2019. Starting July 1st, there will be one worship service in the gym at 10:30am. There will be nursery for little ones during the worship service. All Sunday School programs are cancelled starting July 1st. As of June 25th, the Sanctuary, Foyer, Fellowship Hall, Nursery, Children's room, and all staff offices are being shut down (men's and women's restrooms will still be accessible). This area of the church will not be accessible by the public. Worship services will be in the gym. Everyone should use the south doors off the main parking area for worship services and to visit the church office during the week. The church office has been relocated to the south side of the building in what was the church library. The pastors are each working in temporary locations. The main office telephone is available but the pastors will not have access to the their individual phone extensions during the renovation project. You may leave a message for the pastors through the main office or call their cell phones directly. Email access and public wifi will remain available. The estimated cost of the renovation is $455,000. This assumes that much of the work will be done by volunteers in the church. All funds for the building program are separate from our general operating funds. Donations to the building program can be sent to the church or put in the offering plate by marking "Renovation2018" on your check or use the envelopes provided during worship services. We have obtained a renovation loan which we are hoping to avoid using as much as possible. All money received during the renovation reduces the amount of the loan that will be used and therefore greatly reduces future costs of loan repayment. Volunteers are being scheduled by the volunteer supervisor throughout the project on an as needed basis. If you would like to volunteer, contact the church office and you will be added to the mailing list and receive notifications as help is needed. Please check the website for schedule updates and feel free to call or email the church office if you have any questions! 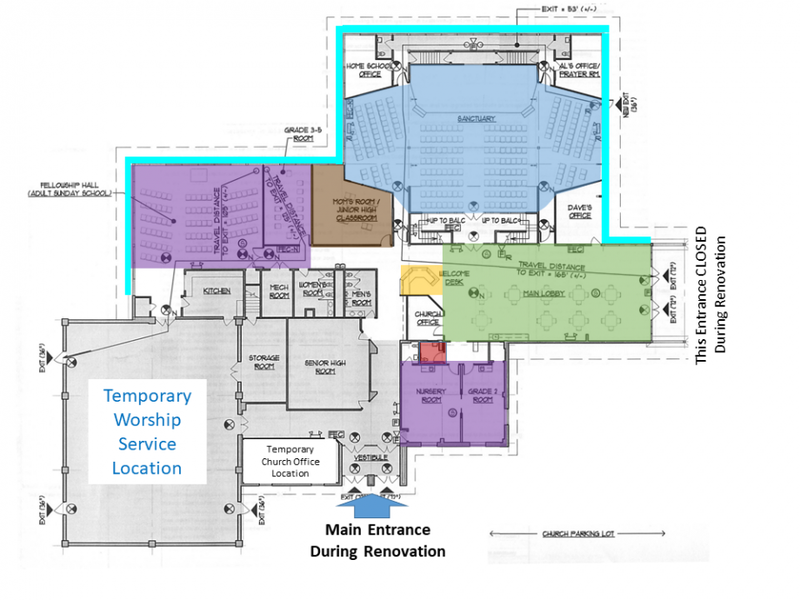 This is a large project and there will be a lot of changes over the summer, but we are excited for how this renovation project will help us better use our church building for the cause of the gospel of Jesus Christ.